South Korea’s new elected President Park Geun-hye spoke of a “grave” security challenge from North Korea but called for “trust-based dialogue”. Park Geun-hye, the ruling Saenuri Party candidate, defeated her liberal rival Moon Jae-in in Wednesday’s election. Speaking after a visit to honor late leaders, she pledged again to “open a new era” on the Korean Peninsula. 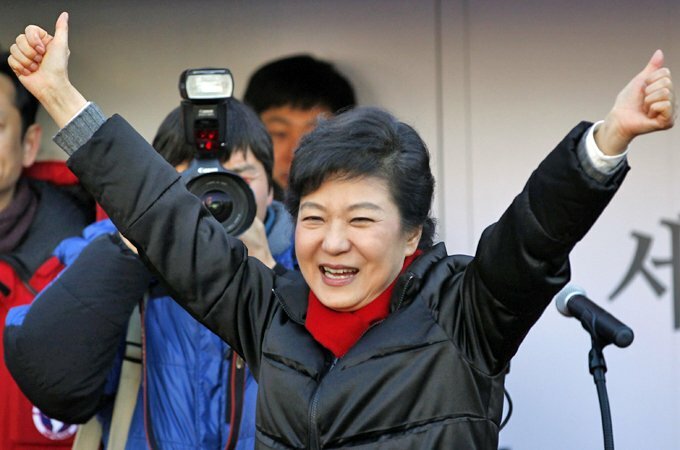 The North has not yet commented on her victory, but earlier labeled the Saenuri Party “maniacs”. A dispatch from state media outlet KCNA, released on Wednesday, accused the party of escalating tension on the peninsula during President Lee Myung-bak’s time in office. “All facts prove that the Saenuri Party is a group of traitors who stoop to any infamy to realize its ambition to seize power,” the story said. The North launched a rocket that put a satellite into orbit last week, a move condemned by the international community as a banned test of missile technology. Park Geun-hye, daughter of former military strongman Park Chung-hee, will become South Korea’s first female president. President Barack Obama congratulated her, calling South Korea “a lynchpin” of security in Asia. “Our two nations share a global partnership with deep economic, security and people-to-people ties,” Barack Obama said in a statement. The election race saw high turnout, with 75.8% of the electorate casting their ballots. With more than 99% of the vote counted, Park Geun-hye had won 51.6% of the vote to Moon Jae-in’s 48%. Economic issues including welfare spending, job creation and inequality had dominated campaigning, while the national security focus fell on North Korea. “The launch of North Korea’s long-range missile symbolically showed how grave the security situation facing us is,” Park Geun-hye said after a visit to the National Cemetery to pay her respects to former leaders. Relations with North Korea under Lee Myung-bak – who linked the provision of aid to progress on denuclearization – have been poor. Park Geun-hye has promised greater engagement than her predecessor and the possible resumption of aid, but also a robust defence. South Korea is also one of several nations currently seeking a strong response to North Korea’s recent rocket launch in the UN Security Council. On the economy, the president-elect said she would work “to make the society share economic benefits without anybody isolated from the fruits of the economic growth”. Economic growth has fallen to about 2% after several decades in which it averaged 5.5%. And in an apparent nod to tensions with Japan over a territorial dispute and historical issues, she said she would work for ” greater reconciliation, co-operation and peace in North East Asia based on correct perception of history”. Park Geun-hye’s defeated rival, former human rights lawyer Moon Jae-in, also offered his congratulations, saying he accepted the outcome of the polls. “I feel so sorry and guilty that I have failed to accomplish my historic mission to open a new era of politics,” he said. Park geun-hye’s campaign was both bolstered and dogged by the legacy of her father, who built South Korea’s economy while crushing dissent. With the country having split almost equally along party lines, Park Geun-hye will have to work hard to improve relations with her detractors.